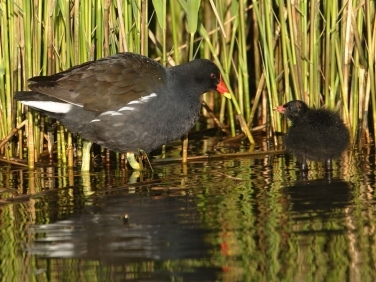 One pair of Moorhen on Swanpool Local Nature Reserve are feeding three chicks at the moment. Many bird species have suffered from one of the wettest and coldest Aprils on record with failed nests widespread. Most species appear to have suffered and even water birds have seen nests waterlogged. Moorhens are considered to be one of the most successful breeding species in the country and take special care with their clutches of eggs, ensuring they are well covered and incubation temperatures are maintained. However, its not just the inclement weather that the Moorhens on this brackish pool have to contend with as the large numbers of predatory rats and gulls present will make short work of any egg or chick left unguarded. 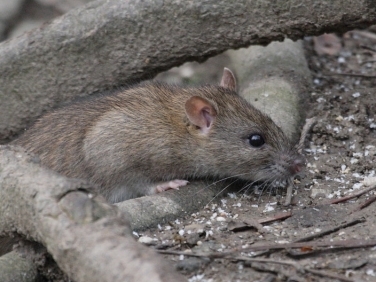 This Brown Rat (Rattus norvegicus) is certainly on the lookout for a meal.